A Mother's Day Surprise - Tomato Tulips! 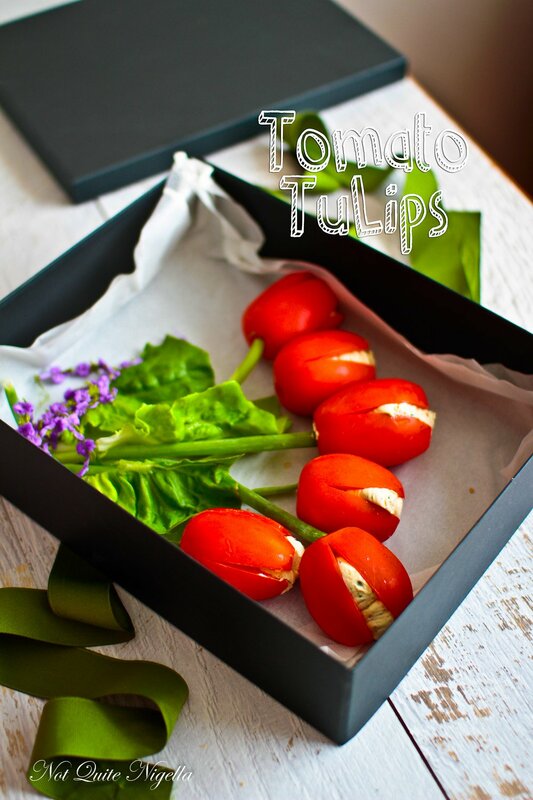 These tomato tulips are as cute as they are easy. In fact it takes about as long to buy a bunch of tulips than to make these edible ones. 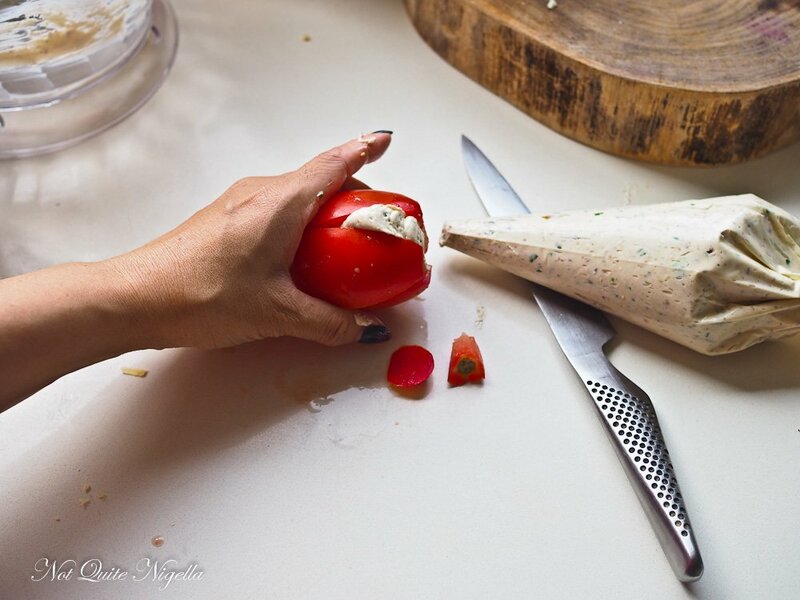 In this recipe Roma tomatoes are sliced and filled with a cream cheese, cheddar and olive dip - think of them like a fresh tomato version of zucchini flowers. 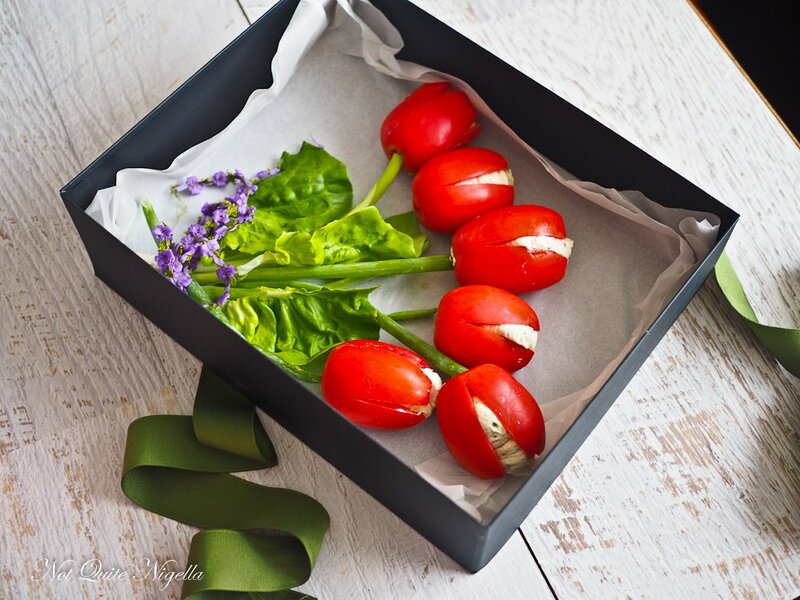 Once placed on the spring onion stems they are perfect to box up and gift or serve for a Mother's Day lunch! Before I made them I thought that they would be quite complicated. So much so that I put it off for a while. I don't usually procrastinate unless it involves things like fitness (I'm just so unmotivated) but when I cut apart from first tomato and filled it I realised how easy this was and yet how effective it was. I got so excited that I started all over again and made a little video showing you just how easy they are! The fact that the video goes for less than a minute (okay some of it is fast forwarded), might show you how simple it is. But it's not just pretty, they are really tasty and if you have a meal planned for Mother's Day then this could be a pretty way to present a "salad". Perhaps you could have three on a plate? Speaking of exercise related procrastination, I realised something the other day. I've been working out with my personal trainer Nina for almost three years now. I think I have become one of her most annoyingly loyal clients (she can't get rid of me) but last week she has been away in her native South Africa. I'm happy to give up training for two weeks but she would have none of it (and apparently that is a sign of my very low motivation levels). Instead she has found a new trainer for me. "Are you ok with a male trainer?" Nina asked me. "Sure, I don't care if it's a guy. But he has to have the right personality. You know what I mean..." I answered ominously, remembering the time they gave me a miniature drill sergeant. I don't like to be yelled at and paying someone to yell at me seemed even more ludicrous so once we ascertained that the male trainer Paul was not an autocrat I agreed to see him. I did try to act normal at first and give a good first impression but within a few minutes he was asking me to box 100 repetitions. I had to explain that I only did sets of 20 with boxing (I have a weird numbers thing) and that I don't like odd numbers unless they are 5's. So numbers like 17 and 19 are just not going to work on me. He seemed to take it in his stride. I'm sure Nina warned him that I was trouble. And then it came to lying on a mat. "Do you have two mats?" I asked him because sometimes the ground at Centennial Park is damp grass and dirt and I don't like the bugs and dirt. He went to fetch another mat from his car. We were halfway through the session when he realised that he had run out of things to do with me because I have knee issues. "What do you like to do?" he asked. Well that was the magic question really. "I love clams (the exercise as well as the food) and Nina brings me coconut water too. She also lets me have a nap," I lied. Well I do like clams but the other two things were complete fibs. But being a nice guy perhaps unaware of how cunning I can be with exercise, he thought about it. "So do you do 10 minutes of meditation? Is that what you mean by a nap?". I saw how sincere and nice he was and thought better of my fib. "No, I was being naughty. Sorry." So tell me Dear Reader, are you an exercise enthusiast or an avoider? Are you doing anything special for Mother's Day this year? If you could receive one gift, anything at all, what would it be? 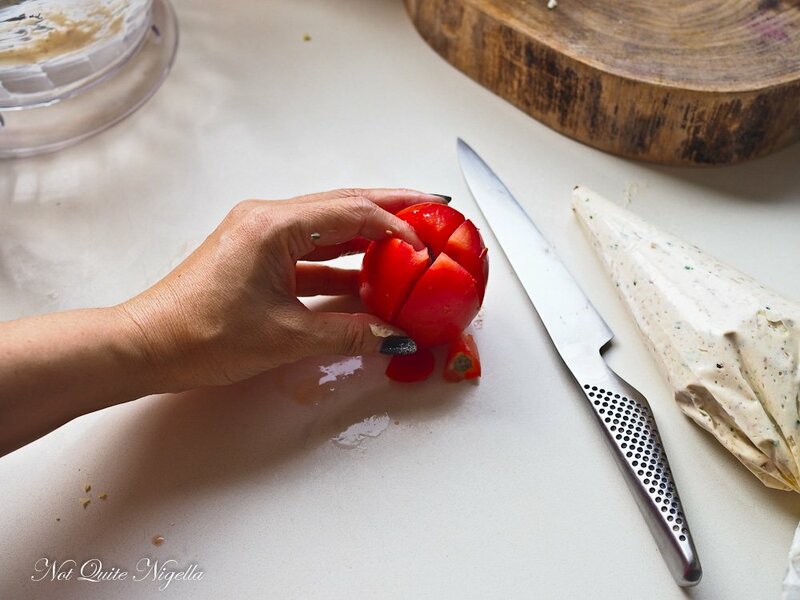 How to make Tomato Tulips! Step 1 - Process the cream cheese, cheddar cheese, 2 sticks green onion and olive dip until very smooth. Place in a large piping bag. 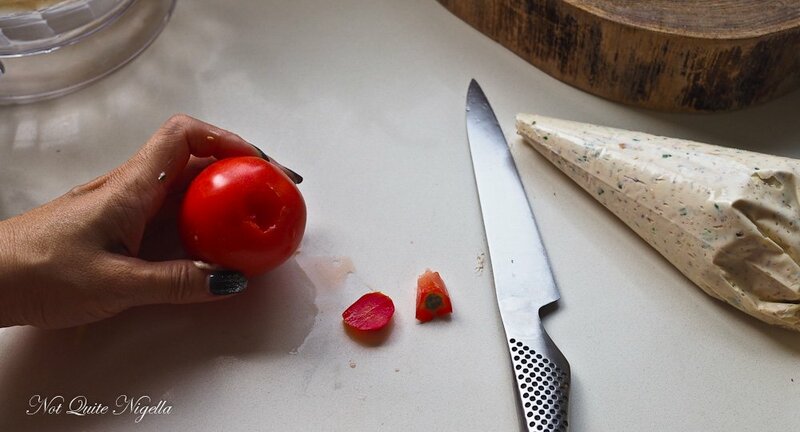 Step 2 - Cut the tops off the tomatoes and then cut out the base. 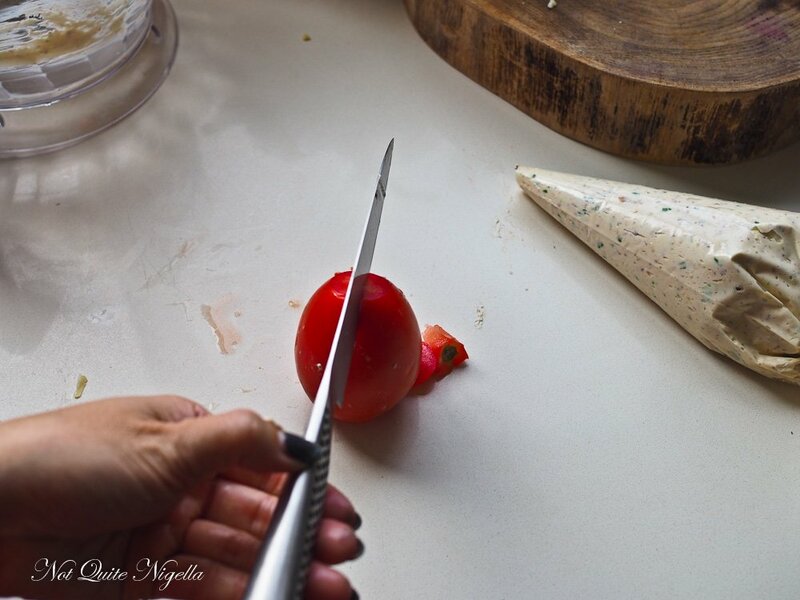 Place the tomato standing up and make two cuts to create four quarters but do not cut all the way through. Snip the end off the piping bag and fill with the cheese filling. Place in the fridge to firm up and then serve with the spring onions inserted into the base.